Harry Fear – Who Will Save Israel From Itself? I will never forget Harry Fear’s live webcasts from Gaza during “Operation Pillar of Cloud”. Came across this new talk just uploaded to YouTube. Harry Fear speaks about Israel’s November 2012 operation on Gaza at the 27 December Initiative in Copenhagen, Denmark. The last segment of Harry’s talk was not recorded. It quoted late Palestinian psychiatrist Dr. Eyad el-Sarraj, who once questioned, “who will save Israel from itself?”. Video record by Mathias Kortegaard. The conference, curated by Ebbe Bertelsen and the 27 December Initiative, also included Dr. Mads Gilbert. A fascinating article from The New Yorker. Much, much more at the link. 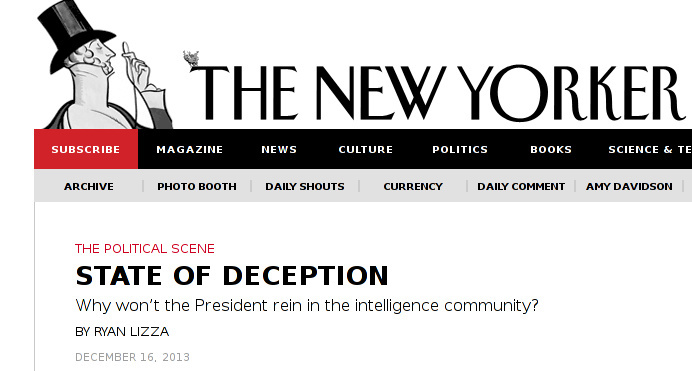 Why won’t the President rein in the intelligence community? Everyone remembers the spectacular four-and-a-half hour meeting last August in Moscow between President Putin and Bandar Bush – aka Bandar bin Sultan, Saudi Arabia’s Director of National Intelligence. Well, there was a remix last week, also in Moscow. And once again in absolute secrecy, until a formidable leak from “a close and reliable source” in Russia reached Lebanese newspaper al-Manar. Bandar Bush’s first offensive was a disaster; not only did Putin rebuff his attempt to “bribe” Moscow into abandoning Damascus, but subsequently Russia was pivotal in preventing the Obama administration from bombing Syria. … President Putin’s answer can be summarized as a model of restraint. The “opposition” armed and financed by Saudi Arabia and Qatar is on a losing streak. Saudi support for the opposition has nothing to do with democracy; these “rebels” are in fact terrorists. Neither Damascus nor Moscow needs Saudi funds to rebuild Syria; Russia, Iran and China will do the job. Moreover, Russia and the US reached an understanding that takfiri terrorism is a danger not only to American security, but to Russian and global security. The Europeans – fearful of returnee terrorists – also agree. For those who think I’m a total lefty, I was actually once, in much younger days, a paid up member of the Conservative Party. I resigned principally over their “Hang Nelson Mandela” campaign, in the early 80s. 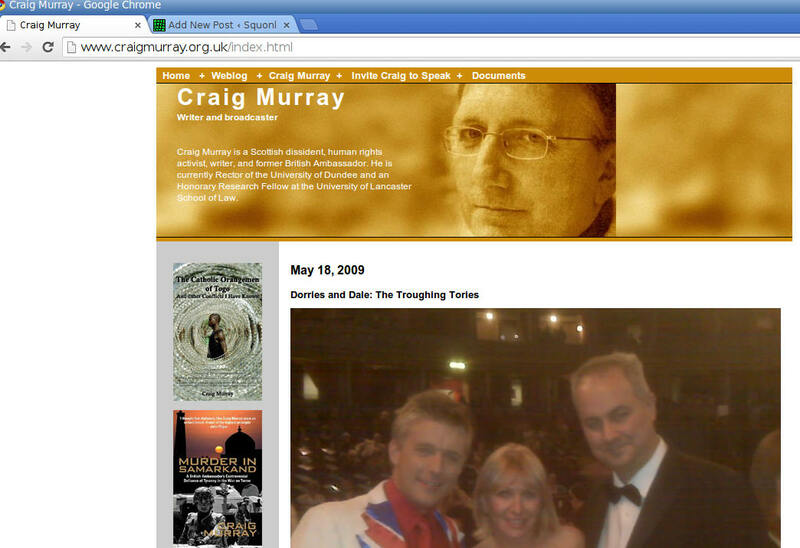 Craig’s Blog craigmurray.org.uk has reverted to 2009. 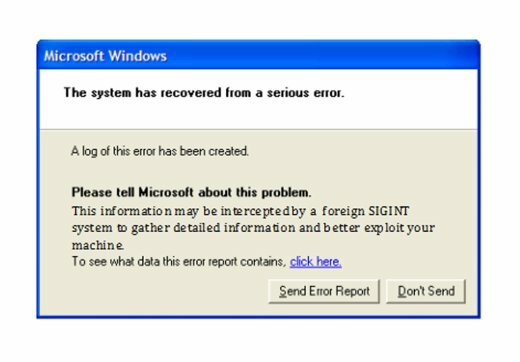 All posts since May 2009 have vanished. Is there anything special about the page currently displayed? Clark has been in contact with Craig (see comments below) and whatever has happened to the blog has NOT been authorised by Craig. Clark is now attempting to contact expathos hosting by email. FURTHER UPDATE: Richard at expathos has explained the situation in a comment here and will get the problem addressed on Monday. Monday: Craig’s blog is back up to date. Thanks Richard Kastelein. Meanwhile there’s a very recent interview with Craig, originally linked by Mary, which you can find in the comments as well.